From metro areas to mountainous regions we implore you to explore your world, find adventure and new ways to live small. On our summer trip to the mountains, my wife had a scheduled interruption as she attended a convention in Denver, while I stayed in the mountains with our pup, Augie Dog. From the campground where we were staying an access trail connected to the Continental Divide Trail (CDT). Augie and I woke on our first day and headed for a leg stretcher on the CDT. On our return to the campsite I noticed a woman outside one of the campground privies. 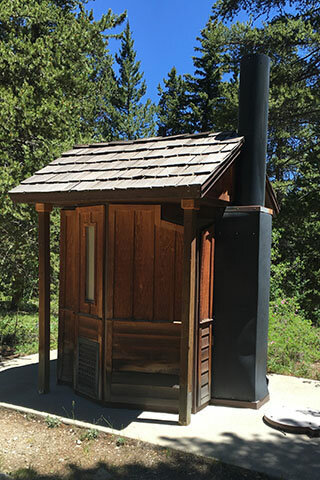 The privy was designed with a rustic look to fit better in the campground setting. As she circled the hexagon shaped facility she seemed a bit anxious. Looking at me she said, "you don't know how to get in there do you?" Chickasaw State Park is a small park located south of Jackson, TN in Henderson, TN. The centerpiece of the Park is Lake Placid. 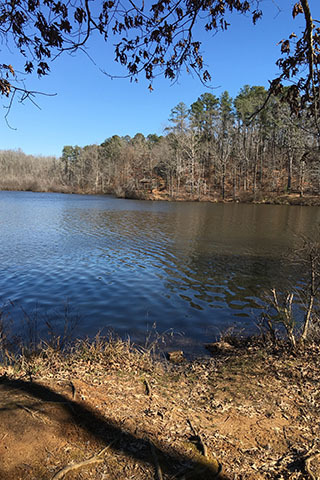 The lake offers fishing, boat rentals, swimming, and a great trail (Lake Shore Trail). Along the shores of the lake are cabins, swimming area, recreation area (volleyball, basketball, playground, ...), Group Lodge, Sagamore Lodge, picnic shelters, restrooms, restaurant, campgrounds, stables, and trails. While looking at maps I recently noted some inconsistencies with our map (cloudhiking.com's map) of Henry Horton State Park (near Chapel Hill, TN) and Google Maps screen view of the area. Simply put, Google Maps seemed to have had more current data than we had on the cloudhiking map. Everyone really is doing it. Climbing, hiking, scrambling, backpacking, mountain biking, trail running, mountaineering, kayaking, rafting, etc, are no longer extreme sports exercised by a few highly skilled elitist, now outdoor sports are popular. On a summer visit to Colorado we stay at Elbert Creek Campground, near the trailhead of the highest peak in CO. We saw everyone doing it on Mount Elbert. 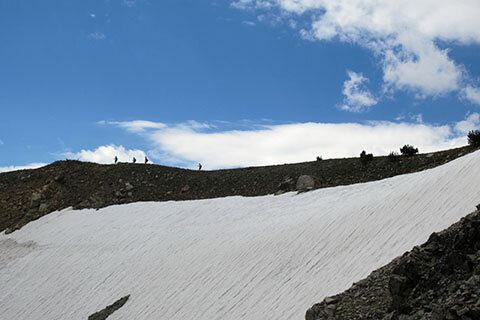 In fact, climbing or rather hiking up mountains is so popular in Colorado that Fourteener (mountains above 14,000 feet) was chosen as the unique Colorado word by Yahoo. 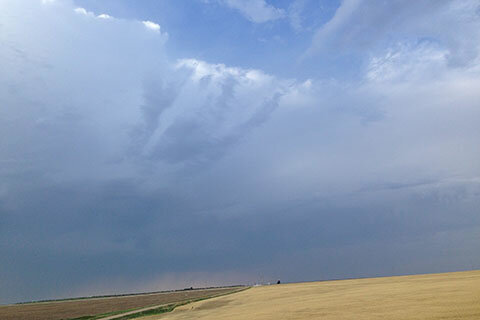 We visited the area on a late July weekend with the rare predication of zero percent chance of afternoon thunderstorms. Everyone came to the mountain, they all wanted to do it. We have visited Half Moon Creek area quite a few times through the years but have never camped there. A fairly descent dirt road (Half Moon Rd) leads to access points for Mount Elbert (the highest peak in CO) and Mount Massive (the second highest peak). Day 5 was going to be our last day of backpacking in the Wind River Range of Wyoming. We started the morning enjoying our five star campsite in Lizard Head Meadows. There was no rush on the final day, as we were only climbing over one pass and hiking a moderate distance. Day 3 started cool and fresh. From our camp we had a good view to the north and could see weather moving west to east across the range. We were sure glad we were south of the stormy weather. Being our third day on the trail, we had perfected our packing techniques and smoothly transitioned from camp to trail with a bit of breakfast thrown down to satisfy our hunger. Rejoining the trail we were just a short walk to Washakie Creek. Boulders and rocks gave us a fun route across the creek without getting wet. There were good campsites (better than our last site) close to the crossing. ... Continuing to Farson, WY we left the pavement and started a fifty mile (no exaggeration) approach drive on dirt roads to Big Sandy Trailhead. Oddly enough, Big Sandy Trailhead was on Goggle Maps. The drive was bigger than life. Wide eyed, we scanned the horizon, as we sped along the above average dirt road. The last 15 or so miles of road to the trailhead were a little less improved. We slowed and dodged ruts and craters on the wash-boarded road. 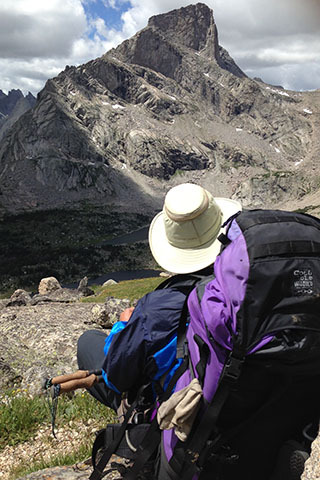 After our trip up Mount Audubon, we returned to the Indian Peaks for an overnight backpacking trip. We had permits for a two night trip, but we needed to let Augie's' (one year old Golden Retriever) paws heal a bit from his first rocky excursion, so we shortened the trip to one night. 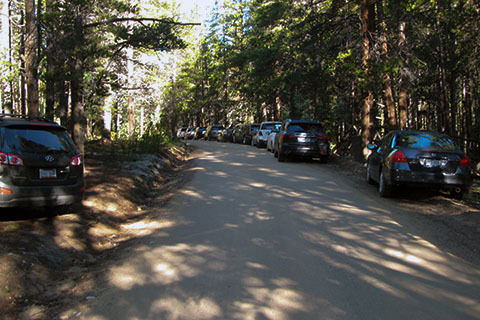 We arrived at Long Lake Trailhead, just in time to get one of the last parking spaces. We were just lucky! From the trailhead, we would take the Beaver Creek Trail to the Mount Audubon Trail and then the Mount Audubon Trail to the summit of Mount Audubon, 13,223 feet. This would be our one year old, Golden Retriever, Augie Doggie's first big mountain. Audubon a Class 2 climb and rated as difficult hike for humans. For the past ten years I have carried a Osprey Talon 44L pack on most of our adventures. The Talon is just large enough to use on overnight trips and yet the pack can be compressed when carrying smaller loads. The pack is lightweight and so tends to suffer from the effects of use. I guess that is sort of a trade off, but after wearing holes in two Talon packs, I was ready to try something new. 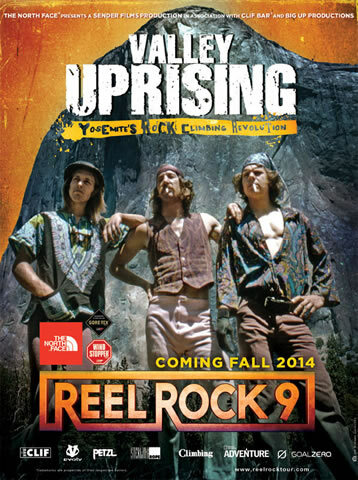 In the spring of 2014, Patagonia came out with a new line of packs, the Ascensionist. I read about the pack and wanted to see one. REI was supposed to carry it, but every store we visited, the pack was out of stock. Finally, we visited a Patagonia store. Sky Pond might not be the perfect name for a mountain lake, but none others come to mind that are better. The small mountain lake sits nestled in a cirque of rocky spires and mountains. Reflections of the sky and surrounding peaks dance across the surface of the aptly name lake. A couple of years ago, we (cloudhiking.com) made a map for Deer Mountain in Rocky Mountain National Park. The map featured the standard, three mile, Deer Mountain Trail (or West Deer Mountain Trail). The trail became one of our favorites for acclimating. 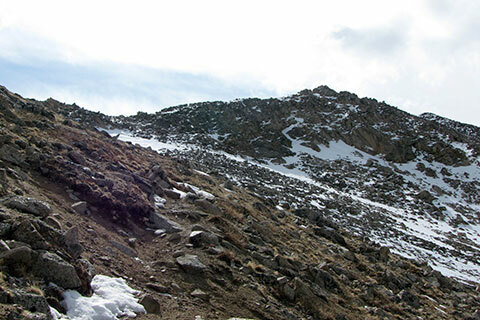 The moderate slopes and relatively low elevation (10,013') helped us adjust to the mountain air. Then a couple of years ago, while Amy was at a conference I spent a day exploring the southern Deer Mountain trails. Starting at Upper Beaver Meadows Trailhead, I crossed Deer Mountain and then returned to Upper Beaver Meadows using the South Deer Mountain Trail system. 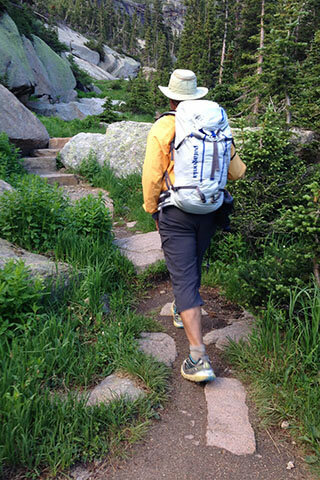 Many hikes in the mountains are out and back, day hikes. The trails follow a drainage that ends on the shores of an upper lake or land formation. To return to the trailhead it is just a matter of reversing the path. Then, there are a few trails that go out one drainage, cross a divide, and then continue as the trail descends into a different drainage. Paintbrush Divide Loop Trail in Grand Teton National Park is one of those special trails that crosses a divide and it crosses in grand fashion. A few years back as my wife and I were exploring the trails of the Tetons, we hiked to Holly Lake to climb Mount Woodring (which sits on the northern shore of the lake.) The trail and Holly Lake were great but the climb was not much fun, but the views were. As we climbed high along the ridge toward the summit of Woodring (we chose not to summit - but that's another story), we were able to see the hiking trail crossing the divide to the west in dramatic fashion. 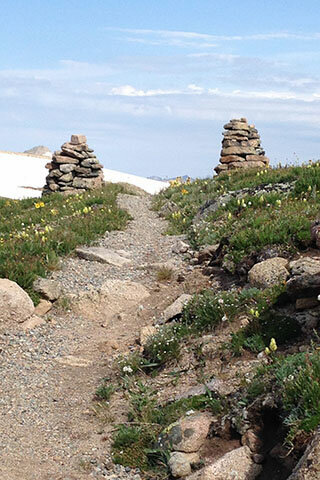 We thought that it would make a great hike, it was the Paintbrush Divide Trail. 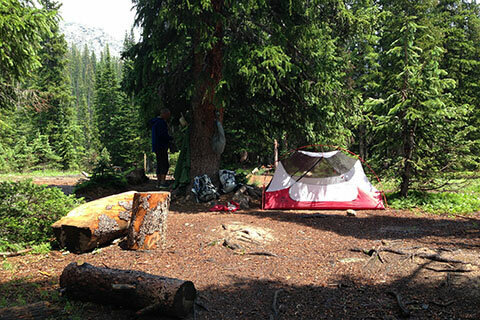 One of our favorite campgrounds is the Jenny Lake Campground in Grand Teton National Park. 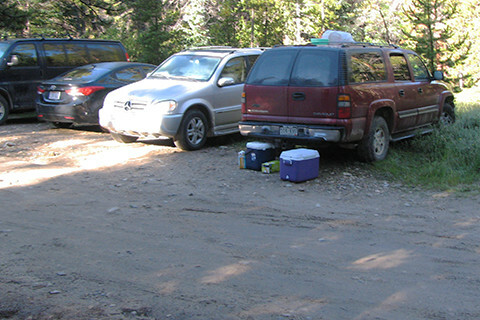 The campground is for tents only and has modest accommodations including: a site number, parking for one vehicle (and one only), a table, fire ring, tent pad, shared water spigots, restrooms at a central location, and bear boxes. Last week, August (pup) and I visited Savage Gulf Natural Area to hike the South Rim Trail. 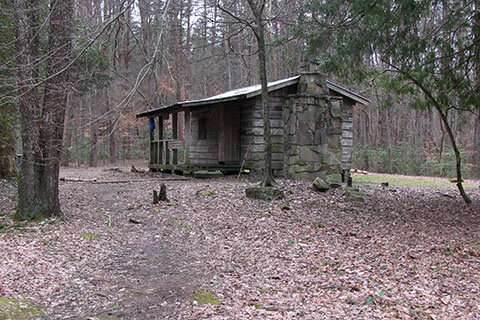 We started from the Savage Gulf Trailhead located off Tennessee State Highway 399 and hiked about eight miles to Stagecoach Road and then returned by the same route. August is becoming a good hiker and companion on the trail. His only problem is getting to the trail. He has issues caused by motion sickness, car sickness, and/or nervousness. Whatever the reason, he loses his cookies (or actually kibbles) on car rides. When we arrived at the trailhead, I had to spend a few minutes cleaning up after our poor pup. 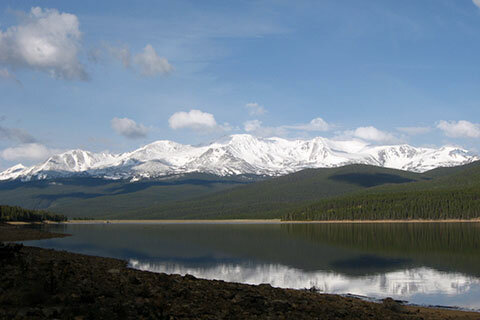 Mount Yale is located west of Buena Vista, CO in the Collegiate Peak Wilderness. 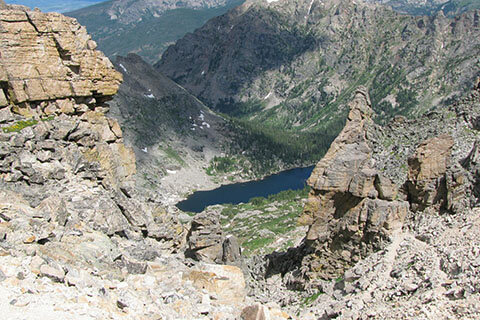 The Collegiate Peaks Wilderness is in the Sawatch Range. 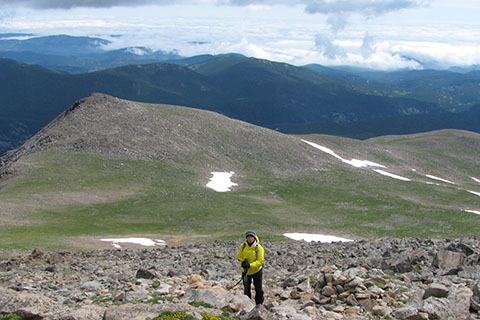 At 14,196 feet, Yale is ranked as the 21st highest peak in Colorado. It stands a foot shorter than it's neighbor Mount Princeton. 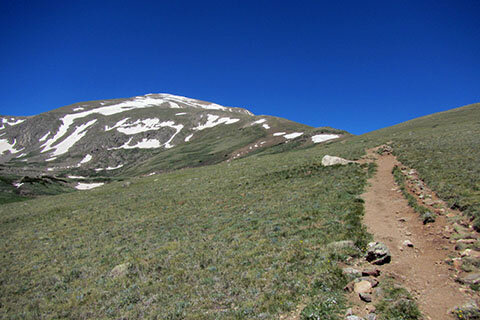 Mount Massive is the second highest peak in Colorado. On our first visit to the area, we climbed Elbert first, but we liked Massive more. We are now, happy to announce the new Trail Guide to the Mount Massive Trail - East Slopes Route on Mount Massive. The Mount Massive Trail is the standard route on the mountain. Mount Yale is a great Colorado 14,000' peak. Located south of Elbert and Massive, Yale lies just west of Buena Vista, CO. The trailhead is accessed by a paved road (CO Hwy 306) and a National Forest Campground (Collegiate Peaks Campground) is nearby. Wow, and if that is not enough, the large parking area is also paved with privies tucked away at one end. However, don't be confused by the easy access into thinking that such niceties are extended throughout the route ... the trail climbs 4,296' in 4.60 miles. In order to climb at almost 1,000' per mile, the route has to go up alot! 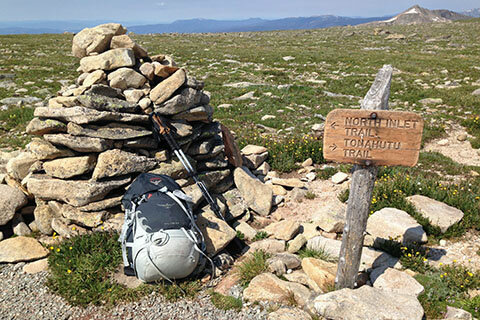 During the summer ('14) we revisited Leadville, CO to climb Elbert and Massive. We had been in Colorado for a few weeks prior to our visit and were acclimated and ready to go. On Elbert we did a tour of Elbert as we climbed North Mount Elbert Trail, descended the South Mount Elbert Trail, and linked the two trail with a section of the Colorado Trail. It was a good day. Our next hike after Elbert, was Massive. We were walking by 0530 and returned to the trailhead at 1300. It was also a great hike. 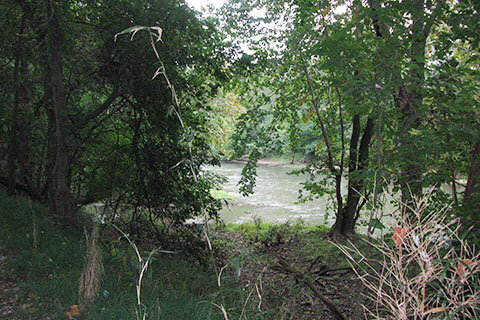 For years we have heard rumors of Pogue Creek Natural Area. We have a friend who was a Pickett State Park Ranger and had hiked into the Canyon. She wowed us with tales of her visit to the area (which at that time was not part of the Natural Areas Program), but we never visited. 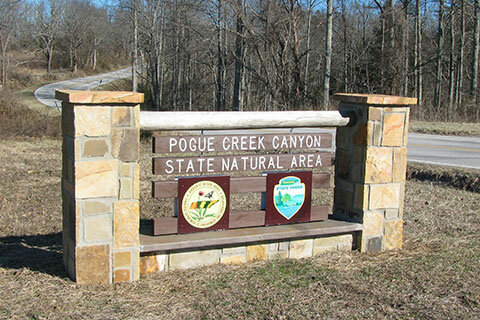 Then last year while working on Pickett State Park maps, we (cloudhiking.com) heard a bit more about the Pogue Creek Canyon area and were excited to work on a map for the region. Recently we posted a new map of the Jenny Lake in the Tetons. Since completing the map we have been working on our first guide to the newly mapped area. The Jenny Lake Trail Guide is complete and posted on cloudhiking.com. Any visit to Grand Teton National Park would be incomplete without a visit to Jenny Lake. The iconic lake is the heart of the Park with views of the Teton Range from it's shore. There is a small dog in our neighborhood who lives next to a sidewalk. We have sidewalks all through the neighborhood, but this is a special sidewalk, it is the secret sidewalk. The sidewalk breaks a very long block as a cut through. A chain link fence surrounds the small dog's yard. Our old dog Jake, was older than this pup, but from the start, Jake did not like him. The small dog would run up and down the fence line as fast as possible, barking. If the dog wanted to bark at Jake, then Jake wanted nothing to do with the small dog. In fact, Jake walked as far away from the yard as possible. Through the years, Jake never grew to like the dog and neither did any other dogs that we saw passing the yard. The small dog was noisy and sort of a bully. We did not know the dog's name, but a neighborhood tot, called him 'Barky Dog' and that was good enough for us. We modified the name to Barker, but then this fall we learned that his name was really Snickers. 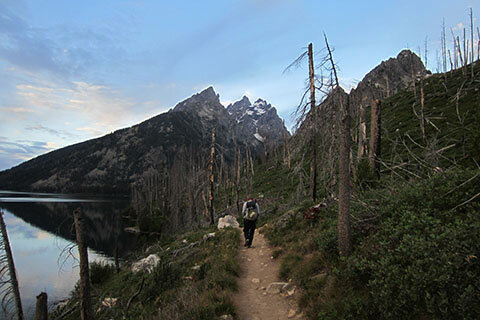 Over the past few summers we have hiked many of the popular trails in Rocky Mountain and Grand Teton National Parks. Our main purpose for the hikes is to gather data for possible maps and guides, but we also hike just because we enjoy moving through the woods and experiencing wilderness. On our daily walks (with Augie, our five month old pup), a short time ago, as we passed a neighbors house, we noticed a slick town bike leaned against a tree in their front yard. 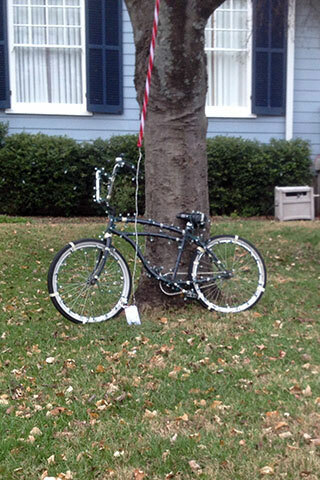 We didn't think our neighbors biked, so we wondered if it was perhaps an early Christmas present. After moving to middle Tennessee in the '80's one of the first places I visited was Savage Gulf. As I explored the area, I soon realized that Savage Gulf was simply, a hiker's paradise. The 15,000 plus acres did not have recreational vehicle campgrounds, inns, restaurants, golf courses, etc., but they did have well maintained hiking trails and a lot of them. A few years back when we started cloudhiking.com one of the first guides we did was of Big Creek in Savage Gulf. The map that accompanied the guide was only of the area of the hike. I was not good enough to make a map of the entire Savage Gulf Natural Area. We had to delay a large map of the whole Natural Area for a few years, but finally decided to work on it. 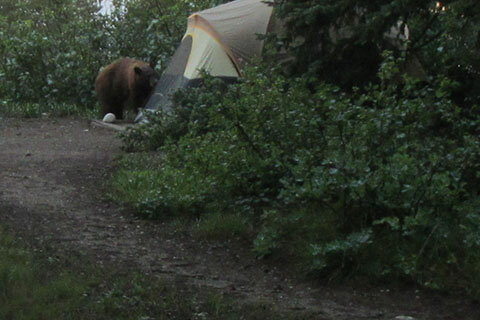 While visiting Rocky Mountain National Park in June ('14) we camped for a short while on the west side of the Park. One of the most recommended day hikes in the west side of the Park is the Shadow Mountain Trail. 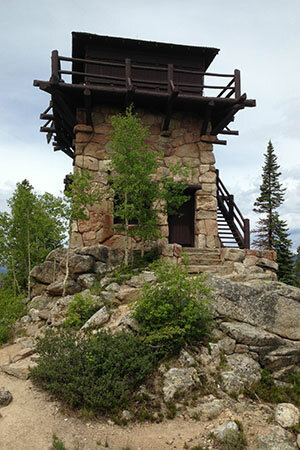 Starting within the town of Grand Lake, the trail follows the shore of Shadow Lake and then climbs to the fire tower on Shadow Mountain. The day before our hike, we drove to town and found the trailhead so that we would know where we were going the next morning. 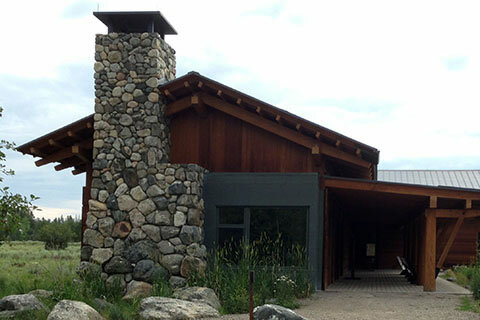 There is a new East Shore trailhead which is located on National Forest land. We had not even taken a step on the trail, but had already formed a favorable impression. Our fall has been filled with a growing puppy. August is now four and a half months old and growing larger and wiser each day. He is not a perfect dog, but he is a fun one. We have been attempting to raise Augie as a socialized and well adjusted pup. The process has actually been easy. The dog loves to meet almost all dogs - big and small, he believes they all want to play with him; and he believes humans - whether they like him or not, they should all be given the opportunity to pet him. Our first hike from the summer of 2014, was the Onahu Creek - Green Mountain Loop, starting from Green Mountain Trailhead. 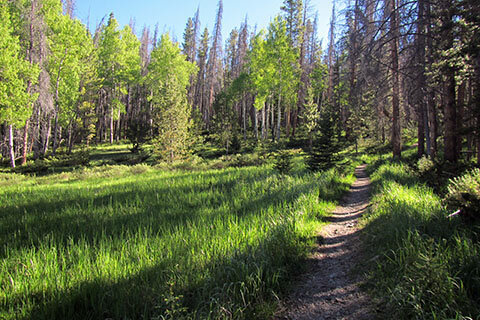 The moderate trail, parallels Trail Ridge Road to the Onahu Creek Trailhead, then climbs through the beautiful Onahu Creek Drainage and over to Big Meadow. Joining the Tonahutu Creek Trail as it heads south along the Meadow, the Loop then returns to the trailhead on the Green Mountain Trail. The route was one of our favorites of the summer. 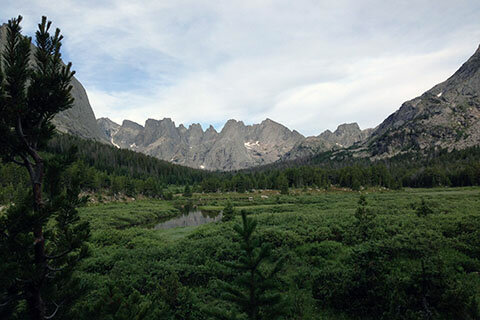 In late July of 2014, we hiked the Rocky Mountain National Park's Loop. The twenty-seven mile Loop is formed by the North Inlet Trail and the Tonahutu Creek Trail. Grand Lake, CO hosts the two trailheads which are located a short distance apart (linked by a gravel road.) 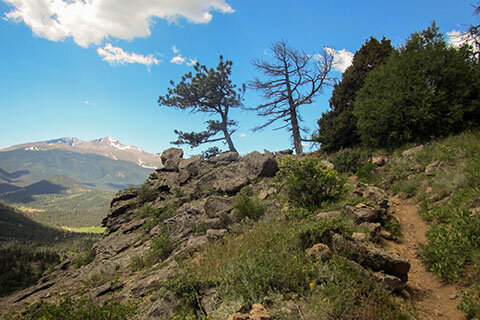 The Loop is a destination hike and one of the best in America. 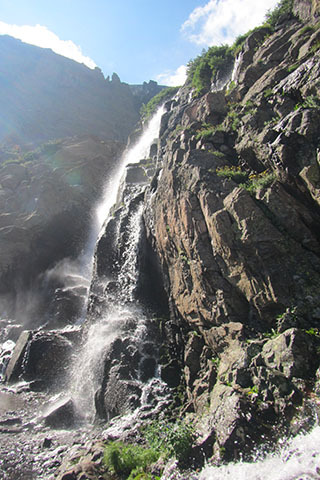 In late July of 2014, we hiked the Rocky Mountain National Park's Loop. The twenty-five mile Loop is formed by the North Inlet Trail and the Tonahutu Creek Trail. Grand Lake, CO hosts the two trailheads and they are located a short distance apart (linked by a gravel road.) 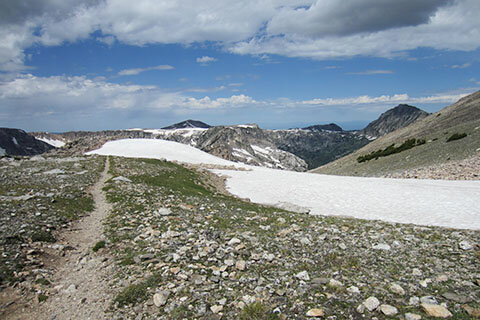 The Loop is a destination hike and one of the best in America. 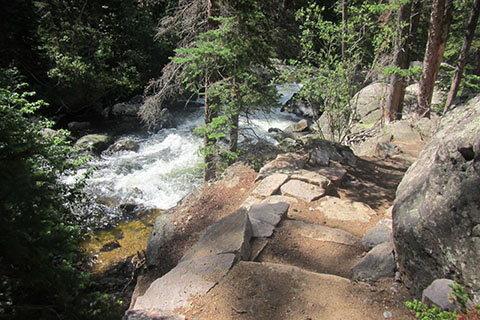 We hiked the North Inlet Trail in Rocky Mountain National Park in July of 2013 and 2014. For years we had visited the east side of the Park, but had made limited visits to the west side of the Divide. In 2013, we planned to spend more time in the wild, wild, west side of the Park. We were able to hike the East Inlet, North Inlet, and Timber Lake Trails. We had reservations to hike the Loop (formed by the North Inlet and Tonahutu Trails) but our plans had to be changed due to wildfires in the Tonahutu Creek area. Our visit to the west was great. The trails were less crowded but still were well maintained and led to great destinations. Over the summer ('14) we finally hiked the Loop in Rocky Mountain National Park. The Loop is on the west side of the Park. The route starts in the valley, travels one drainage to the alpine tundra and the Continental Divide and then returns to the valley by another drainage. 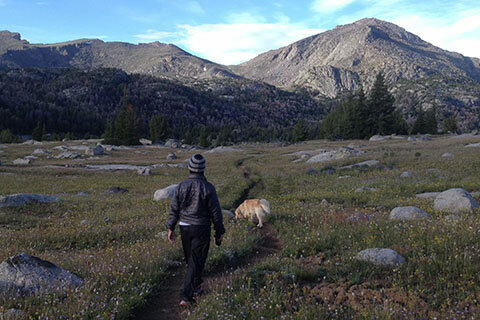 The Loop is just over 25 miles long and is a very popular backpacking destination. I consider my wife and I to be savvy long distant motor vehicle travelers. To prepare for our long trips we do such things as time when we are going to pass through towns to avoid traffic, check the weather to avoid storms, look for construction delays, etc. We are constantly monitoring our time and distance and would alter our route in order to miss delays. To help us with our travel plans we use iPhones and iPads while in the car and MacBooks when we find a wifi signal. We are truly connected and in tune with our drive. Of course from time to time we still find that despite our best planning we still find traffic, weather, or just the unexpected. We expect it. I sweat a lot. When running, I sweat so much that it really seems almost unnatural. After just a few miles of jogging, my shorts and shirt are usually soaked. 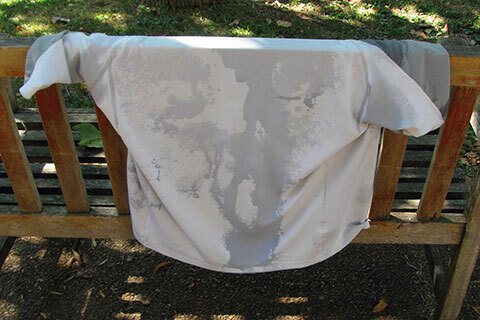 I see other runners that are barely sweat soaked, maybe a bit under their arms, while I am leaking everywhere. The Laurance S Rockefeller Preserve in Grand Teton National Park is a special place. 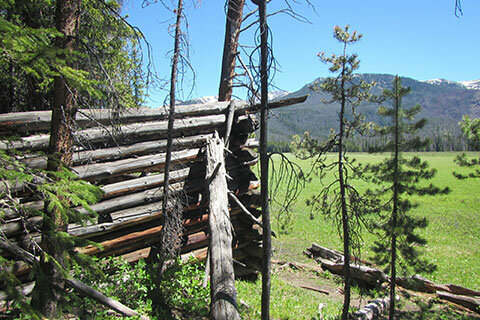 The land was once a homestead, dude ranch, private resort, and finally a donation to the (Grand Teton) Park. In the spring ('14) we purchased a new tent, the new (or updated) MSR Hubba Hubba (NX) - 2 person. Since we knew that we were going to use and depend on the tent for the next few years, we had to pick a tent that best met our needs. (See the link to our choosing the Hubba Hubba.) After purchasing the Hubba, we set the tent in the backyard and played with it, we still had not used it as an everyday sleeping quarters until the summer. Though we initially liked the tent, we wanted to give a follow-up review at the end of the summer. After finishing the Mount Elbert Map and the guide to the North Mount Elbert Trail for cloudhiking.com, we were trying to decide what was next ... 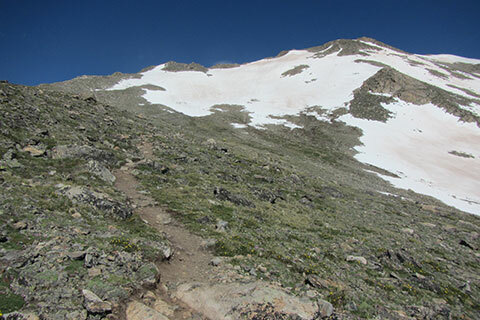 I couldn't find some map data for a Teton trail, so by default we decided to complete Mount Elbert with the guide to the equally popular South Mount Elbert Trail. 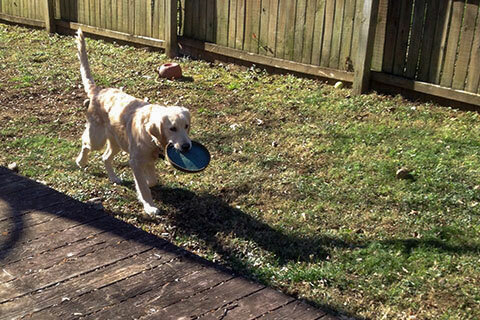 Since we lost our Jake in May, much of our attention has been focused on getting another dog. There has been many things to do ... deciding on the breeder, the deposit, the waiting, the choosing, the naming, etc, and then last Friday, the big day finally arrived and we picked up the puppy. Though we had only seen him once, in a crate full of puppies who all looked exactly alike, Amy immediately saw August. I held the pup as Amy went through all of the details with the breeder. Amy pretended to be listening to the breeder's instructions as she watched us with envy. 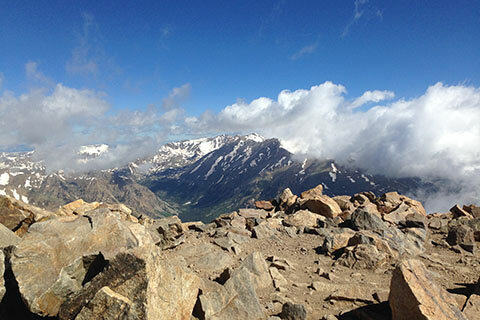 During the summer ('14), we re-climbed Mount Elbert. We had climbed the peak a couple of times before, but were still looking forward to the challenge. 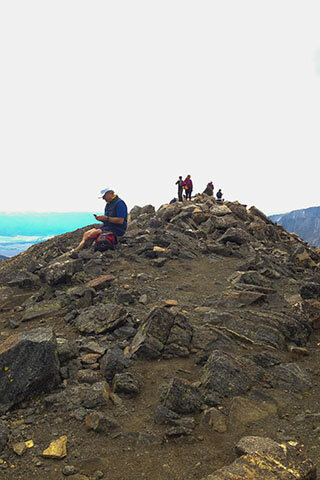 It was our first 14,000 feet peak of the summer so we hoped we were well acclimated. From the North Mount Elbert Trailhead we took the North Elbert Trail up the Northeast Ridge, then descended from the summit via the South Elbert Trail down the East Ridge, and finally returned to the North Trailhead by hiking north on the Colorado Trail. The route was a good tour of Elbert. So the day for a new puppy is coming soon. 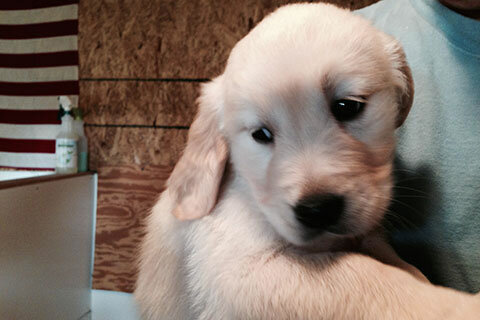 Friday, we visited the kennel and picked out the new cloudhiking (.com) pup. 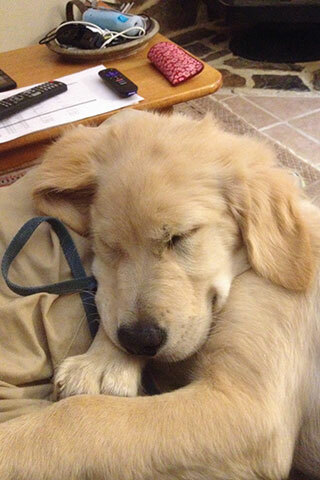 He is lively, active, and cute. We get him on Friday! 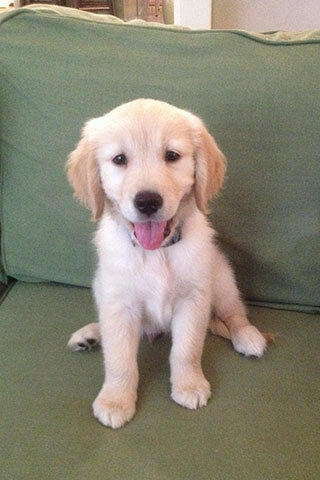 We think he will be a good companion. Any suggestions or comments are always welcome. Thanks for tuning in. Please, share with your friends.